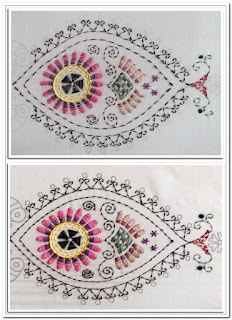 The beauty of world stitching. 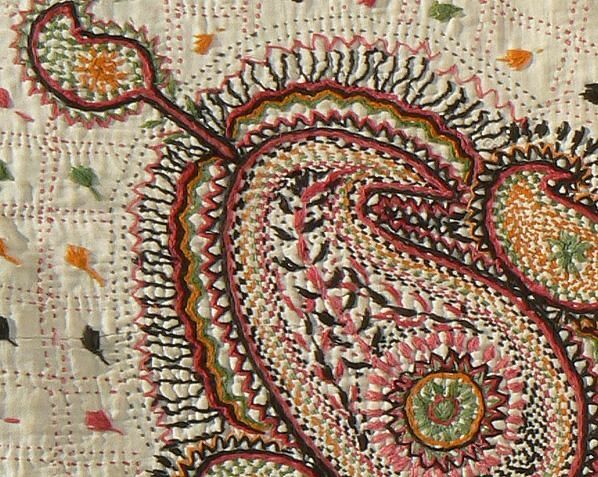 Kantha is a type of embroidery in eastern South Asia, especially Bangladash and parts of West Bengal and Odisha . In Odisha old saris are stacked on each other and hand-stitched to make a thin piece of cushion. This is normally used above a bed cushion or instead of a cushion. 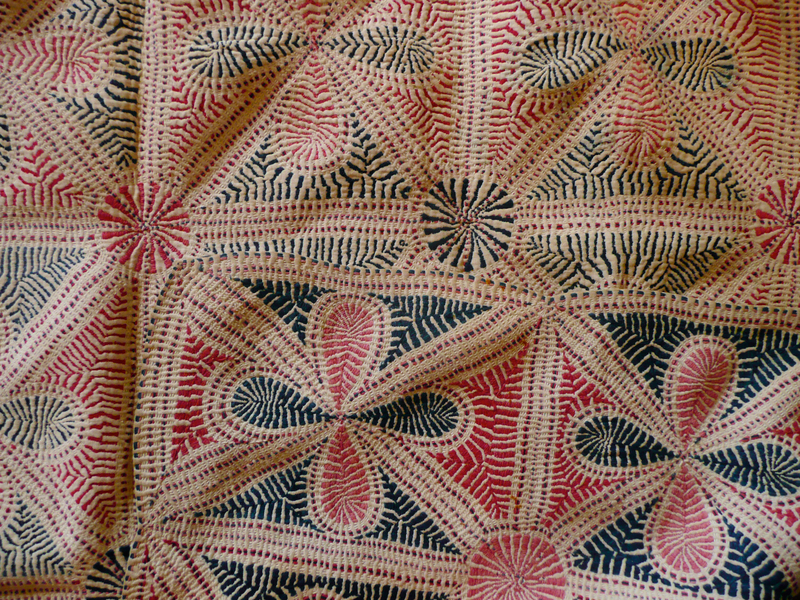 "Kantha saris" are traditionally worn by women in Bengal. 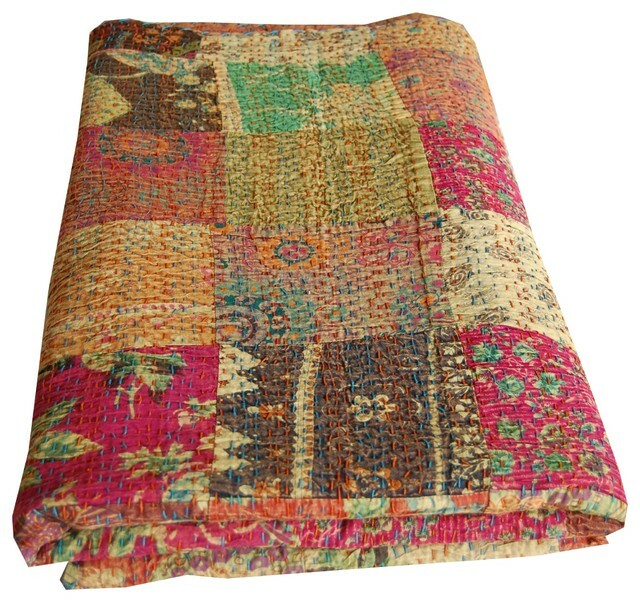 Kantha stitching is also used to make simple quilts, commonly known as Nakshi Kantha . Women in Bengal typically use old saris and cloth and layer them with kantha stitch to make a light blanket, throw or bedspread, especially for children. The technique used in Kantha is very rhythmic and is a sort of running stitch which, when you get into the rhythm of it can build up very quickly. It is often used on soft cottons and your could put a few vintage hankies together and stitch them ... You could stitch different squares and stitch them together to make a wall hanging or large for a quilt top maybe. You would need to tack the layers together and if you would like to do white on white then use a very bright colour tacking thread to help unpick it later. You need to tack to stop movement of fine cotton. If you wish to use bright thread to stitch then another bright thread for taking as white would get lost in a sea of little stitches. four times to make little squares of the stitches. Leave a gap and repeat. 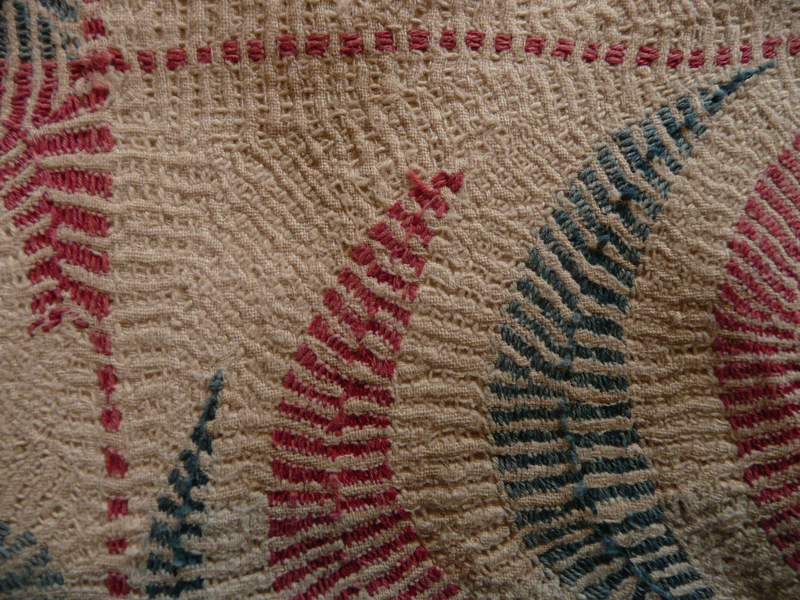 Or go around and around like a maize that could look great and of course you could keep swapping thread colours too for interest. You could make zig zags of running stitch and your square would almost look like a wave ..
shirts for men and women, bedding and other furnishing fabrics, mostly using cotton and silk. When I was at the Victoria and Albert museum in London with our friend I saw some examples and it is beautiful especially when you make shapes with your running stitch like flowers, leaves, animals or indeed the paisley tear! You can let your imagination run wild and it is another way of using vintage white plain hankies and maybe the top one of the layer it could already have some vintage embroidery on it to add to the design and interest. 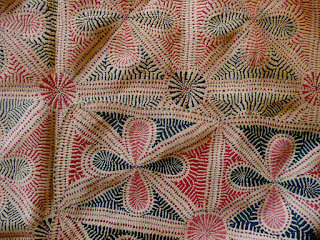 sari fabrics we can use vintage cottons or hankies to do squares of interest and then hand embroider them together with colourful threads or indeed stitch them together on a machine, although I prefer the hand way, sat in a chair and you could stitch them together as you go if you wanted so that it does not seem like lots of work. I think one of these day a wall hanging in this would be so great say a nine or 12 patch would look so pretty. 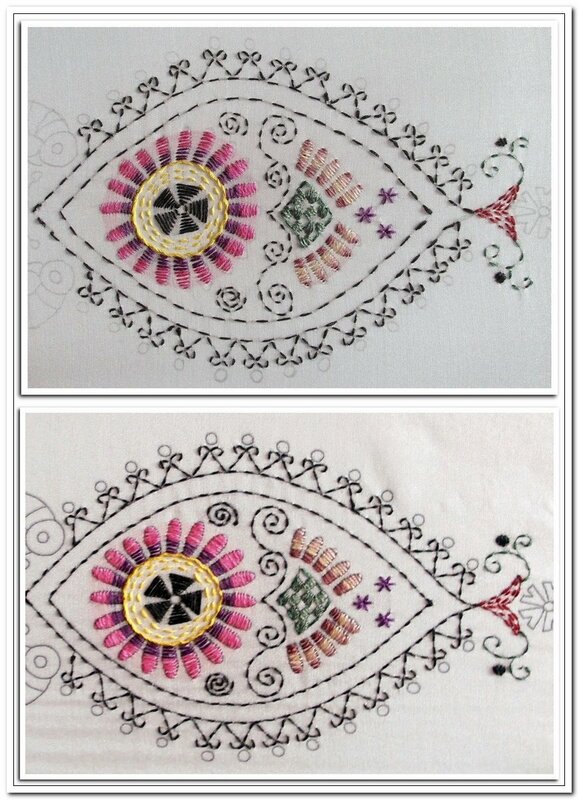 This is all running stitch just applied in different forms and as you can see it is so effective and pretty. You can use very fine linens but I feel the cottons work better and they are more authentic as well with its shear feel. The important's I have been informed is the layers and tacking so it is well worth doing to keep the squares .. well square. I hope you have all enjoyed this little insight into this beautiful embroidery and I think I may try and find a tutorial on this for this up and coming Saturday for us all to look at. 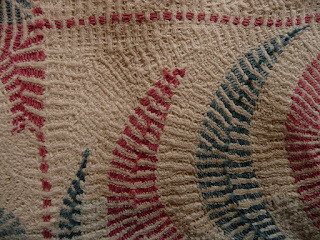 It's a great stitch and you can make some lovely fabric art. Saw it at the V & A ..